Well not much is happening.. still setting up everything related to the new TV. So I think I'll take a break for a few days unless something writeworthy takes place. If I'm not back before 2009, I wish you a very very happy New Year and wonderful 2009! Meanwhile, here's my favorite track from an album that I described in a review as something to the effect of "the soundtrack to the best vacation you ever had." I started off my Saturday not at Costco as usual, but at Circuit City. I purchased something from them the day before and spied the exact same thing advertised at Fry's for $100 less when I opened the paper this morning. The first thing I was told when I asked where to go to get a price match was that Circuit City might not price match Fry's. Why not? Because, she said, Fry's sells used and refurbished stuff and they aren't authorized to sell a lot of the things they have in the store. Now, I hate Fry's myself but still that seemed a rather harsh thing to say and on top of that it wasn't true. As I told the CC employee, the Onkyo website (that's the manufacturer of the product I wanted to price match) lists Fry's as one of the places to buy their products, whereas they don't list Circuit City. Maybe it is because CC filed for bankruptcy? Anyway, she told me I needed to check with the manager. The manager gave me the same story and also said the product had to be new (which the ad said nothing to the contrary) and it had to be in stock. The manager then had another employee call Fry's to check while she ran off somewhere. The other employee called, found out it was new and in stock and said it was legit so I should get a price match. Then he disappeared and I couldn't find anyone for several minutes. So that's how they handle a price match - they just make themselves unavailable and hope the customer gives up. Finally I found all three of them standing behind the door in an "employees only" section. To their credit they weren't trying to hide, but the manager was pointing to something posted on the board and talking to the other two employees. I thought that was pretty rude of her to have ignored me like that and left me waiting. Then one of the other employees walked over and told me I could handle the price match at the customer service/pickup register. The manager was probably pointing out procedures on how to get rid of annoying customers requesting a price match and asking her two staff people why they let me get past the gate. In the end I received $119.08 - the difference plus 10% plus tax. Or rather, I received a promise that the corporate office would mail the check to me and I would receive it within 5-7 business days. So it's still not over. At least Fry's is good for something! I'm so glad I bought the TV at Costco instead of CC (although it still hasn't been connected/set up as of this writing.. I did tons of rewiring today and it's nearly done). Any problem at Costco - they fix it right away. 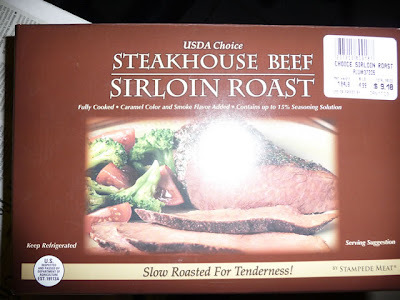 Haha.. yup, I guess I should be getting the "mature adult 50+" bottle from now on, sigh..
And this sirloin roast looked like it might be good so I put it in the cart. They've had it for a couple of months and it hasn't disappeared from the shelves (unlike CC employees handling a price match) so I figured it must be okay. I also checked the prices on HDMI cables for connecting the TV to the receiver. Whoa, $49.95 for 2 12' cables! I passed. It's a lot cheaper on Amazon. After lunch we went to Big Lots as I was hoping they might have a cheap HDMI cable (these handle digital signals - either the signal goes through or it doesn't, so fancier cables aren't going to make the signal any better). They didn't have any so we went to Target. I had won a $50 gift card at our company dinner dance last year (2007) that still hadn't been used since both Julie and I hardly ever shop there. I figured I might as well buy the HDMI cable over there and use up the card. By the way, I overheard two old ladies talking at Big Lots. OL1: (pointing to a box of cereal in the cart) Do you want that cereal?? OL1: Then why'd you put it in the cart?? The cable they sold at Target was $39.99! Argh, even though I had a gift card I hated spending so much for a dumb cable! That exact same cable is $14.09 on Amazon. After dinner we went back to Target and returned the cable. I don't need it right away so I thought they would give me back cash and I could take the $43.29 and put it to better use. Wrong.. if you get a refund on a purchase made from a cash card, they put the money back on the card. Cheapskates.. so now I have a $50 Target cash card again, following me around like a bad penny. You know what it is - HDMI is the "latest technology" so just like S-Video cables used to be so darn expensive but now are cheap, HDMI sells at a premium even though it probably costs them 50 cents to make a $39.99 cable ($14.09 at Amazon). Before I start sounding too much like a crotchety old fogey, I'll end here. And here's today's YouTube, dedicated to that manager at Circuit City, haha.. I took a trip to Costco and then Circuit City this morning (Friday) to look at... LCD televisions. Yup, we finally decided to take the plunge and splurge with our Christmas loot. Costco has good prices but not much selection. Circuit City has much selection and their prices vary, some good and some not so good. We were looking for a 37" model because that seemed to be like the baby bear's bed, just right. Anything larger would seem too overwhelming. Costco had a 37" Toshiba but I wasn't crazy about the picture. The next size up was a 40" Sony, but that was over the size limit. Circuit City had a wealth of choices. I guess they have to charge more for their overhead. I came home and mulled it over.. Neither store had been very crowded. After lunch (literally right after, since we had Costco Polish dogs to eat) Julie and I went back to Costco and looked at the Sony, measuring tape in hand. 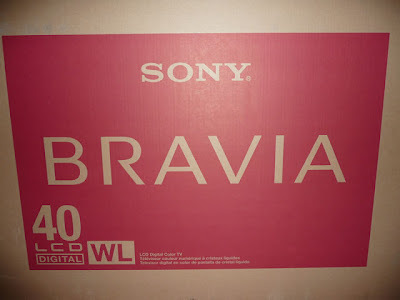 The 40" Sony was only 2" wider than the 37" Toshiba. Still, it seemed too big. She had another store she wanted to visit so we decided to go there, then to Circuit City so she could see what they had. We ended up not even going to Circuit City. After mulling it over, we decided it was better to buy whatever we were going to buy at Costco because if there was anything wrong with the item, we'd have no trouble returning it. And I'm a Costco fanatic anyway - you have to be true to your school! As for the size issue, 2" difference (1" on each side) was negligible. To my eye, the Sony's and Samsung's had the best picture, and, since Costco had the Sony, then Sony it was. As I write this, the TV is still sitting in an unopened box. I'm the type that likes to read the instructions first so that's what I am gonna do as soon as I finish typing this blog entry. See how diligent I am? First things first, I type the blog entry and then pore over the instructions. I'll report back to you how it turns out! Oh, and of course I am going back to Costco tomorrow for my regular Saturday morning visit. I'll let you know how that turns out as well..
Well I hope you all (whoever you may be) had an enjoyable and blessed Christmas. I also hope no one is suffering from PCL (Post Christmas Letdown). There's the days before Christmas filled with the joy of the season and anticipation of the big day, then the big day itself, and then the letdown afterwards when it is all over (especially if you have to work the next day -- ugh.. thankfully I don't!). In a material sense, this year is kind of different because I received some money for Christmas so I am still in anticipation mode, about to head to the stores to take advantage of their last gasp to stay in business drastic pricing anything goes sale mode prices. In a spiritual sense, the joy of Christmas should be with us the entire year and that is what I am going to attempt to remember, and practice. Yesterday was nice. My folks and the kids came over for the day part and we spend the evening part with Julie's side. I guess the most memorable thing from yesterday was when my mom got up to use the bathroom and after a little while I kept hearing water running - like on and off, on and off. So I went to the bathroom and knocked on the door to make sure she was okay. She opened the door and I asked her what she was doing. She pointed to the bathtub and there was a giant cricket that she was trying to wash down the drain by turning on the faucet. "There's a big cockroach in there," she said. "It's a cricket, and don't try to do that," I told her. I didn't want her slipping or anything when she bent down trying to get rid of the pest. I got a kleenex and squashed the menace (I know, I know, crickets are supposed to be good luck in some households but I hate crickets so I delight whenever I can reduce their population). "Gee, that was easy," my mom said. Then we had dinner at the only game in town (only kind of restaurants open on Christmas - Chinese). This was at the Empress Sea Harbor in Monterey Park and it wasn't very good. The food itself was okay but it took forever to get it (they forgot about our order or misplaced it or something) and the portions were downright miserly. They didn't even have kung pao chicken that someone ordered. Instead they brought this pathetic chicken dish with little pieces of boiled chicken, cashews and two or three pieces of green something to add color. I don't think there would be much general interest for a DVD like this, but for me I was very happy to receive it. The main "movie" (documentary) is 70 minutes long but it also contains 75 minutes filmed from the top of a vehicle going the entire distance of the street from Wilshire at the north all the way to Palos Verdes. Now I think you'd have to have grown up in the 'hood to really appreciate something like that.. which I did. 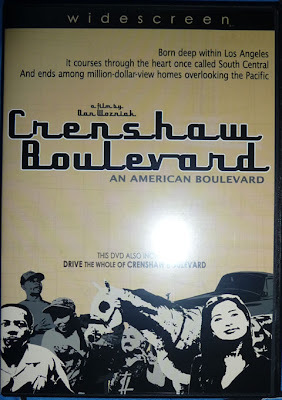 Like I said, I only watched part of it, the drive portion from Wilshre to Leimert Park. Interesting to see the places you grew up with committed to a DVD. Well.. that's it for now. I'm off to try and stave off the material side of PCL by heading over to Costco! I'm actually writing this at noon on Christmas Eve so I don't know what the rest of the day has in store. Our Christmas Cantata is tonight and my sister will be coming over after work to go to dinner with us and then the Cantata. This morning (Christmas Eve) I had to go to a couple of banks to take care of some business for my folks. The woman at California Bank and Trust remembered me and my name as well, even though I hadn't been there in over two months and have only met with her twice. How's that for service? Union Bank is the same way. They both make you feel like a real customer, not a statistic. I hope that the season has been good to you and I wish you a very merry, safe and blessed Christmas. May we all have many blessings to count! Does it feel like Christmas Eve? I hope so, and I mean in a good way. I am writing this on Tuesday evening. Julie was crazy enough to go to Costco this afternoon and she said the parking lot was completely full and there were lots of people in the store. The lines weren't that long, though. I was a homebody today. The AT&T repairman showed up around 11:30. I saw his truck outside and checked my phone. The dial tone came on. He knocked on the door and I said the phone is working. He knew that - he told me the problem was a loose wire at the junction box and he was here to make sure that he put the wire in the right place and didn't accidentally give us someone else's phone number. Just think of all the havoc someone could cause if they got into the junction box and switched all the wires around. I told him the first thing I thought when I heard the dial tone was, doesn't that always happen - you call for repairs and when they show up, the thing is working again. He laughed. Actually, I wasn't a total homebody. I went for my run later in the afternoon, looking like a fool wearing shorts and a t-shirt in the chilly weather. It was a nice run and gave me more of a Christmas feeling, being out in the crisp, clear air. My left shoe squeaks. The big event of the day was accidentally swallowing half of a rather large grape tomato. Somehow when I put it in my mouth it went in my throat before I could chew it. It seemed smooth enough and since it was round I figured I would just swallow it and it would slide on down, case closed. Wrong. It seemed to go down very slowly. I didn't start choking but I felt like it might get stuck there. I started wondering if I was going to choke to death but finally it disappeared wherever food goes after you swallow it and I breathed a sigh of relief.. ah, how good to breathe! To celebrate Christmas Eve, today's YouTube clip is from one of my very favorite movies. I absolutely love this ending. Every time I watch it I can't keep from crying because it is such a nice ending. Ah, this is how Christmas should be. Not much to write today although that never seems to stop me. Just some odds and ends..
A few weeks ago I was all hyped up at the prospect of 18 MB/second download speeds with AT&T's U-Verse system but it turned out the technician was unable to install it. 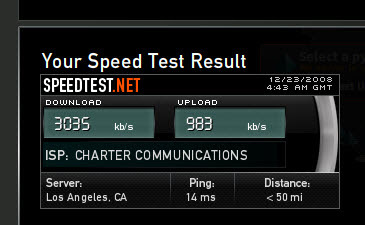 Instead I upgraded my Charter cable internet to 10 MB/second speed. Unfortunately it is not always 10 MB. The problem with cable is that the more people who are using it in the neighborhood, the slower the speed. I get 10 MB in the morning and sometimes in the afternoon, but at night - forget about it. Here's a screen shot I took around 8:30 p.m. Still, the pages load fast enough for me so I'm not complaining. Remember when we all had phone modems (pardon me and no offense if you still are) and a speed of 56K was considered blazing fast? How quickly we (or at least I) forget. It took me over an hour and a half to close out a CD at Bank of America yesterday afternoon. I won't go into details but let's just say it was an example of Murphy's Law hard at work. Just a couple of examples for you: a bank notary that wouldn't notarize a document even though their legal department told her it was okay to do it, so I had to run next door to the escrow company a couple of minutes before they closed to have them notarize a bank document and pull $10 out of my wallet to boot.. and they misspelled the name on the bank check and had to do it over again. Mind you, those were just two of the comedy of errors. The main person who was assisting me was trying to be helpful but that bank makes it much too difficult to do business with. It was her birthday today. After the ordeal was done and she apologized profusely, I laughed and wished her a happy birthday and Merry Christmas. I told her I was sorry to give her a headache on her birthday (even though this was totally the bank's fault). I love Christmas carols. Not stuff like "Jingle Bell Rock" or "Santa Claus is Coming to Town," but the genuine articles, the songs written for the real meaning of Christmas, the birth of Jesus. Even though I was not raised as a Christian or of any religion and had only a vague idea of the story of Christmas when I was little, I was enchanted by these carols and how beautiful they sounded. 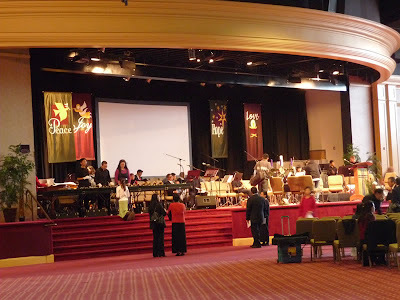 Since then, becoming a Christian has only enhanced how special this music is. 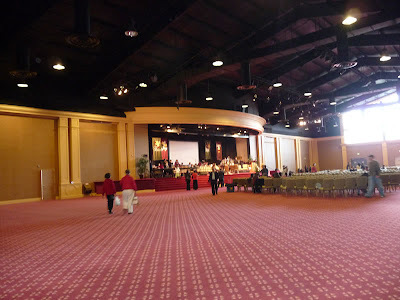 Here's some pictures of the sanctuary, taken in the afternoon when everyone was starting to file in. 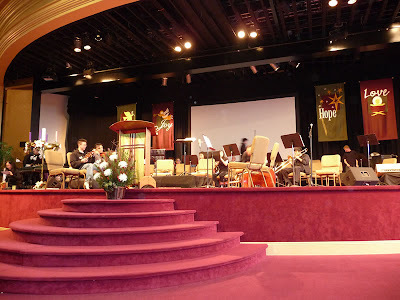 The only drawback to being in the Cantata is having to wear a suit, haha.. Does it feel like Christmas to you? I don't necessarily mean celebrating the birth of Christ, since not everyone is a believer; what I mean is, are you getting that feeling of peace on earth and good will towards man? It's sad that there are so many efforts underway to turn Christmas into a generic holiday. Part of what made the season special were the many Christmas episodes on television. These days its a battle just to mention the word "Christmas" or the name "Jesus Christ" (except for swearing) on the air or at public functions (like schools). I've so many fond memories of Christmas, from as early as I can remember. Both before and after becoming a believer. Regardless of the time, it was still "Christmas" to me.. May you all be having a wonderful Christmas season! Here's a clip from a show back in the 1980's where they weren't afraid. As an aside, my favorite character in that show was Agnes DiPesto. I always thought she was a cutie (about 2:40 into the bottom clip). Costco was more crowded today than it has been in a while. I got there when they opened so checking out wasn't too bad, with lines averaging about 5-6 shoppers each. The parking lot was pretty full when I left, something I haven't seen in a long time. Rice has gotten so expensive! A 50 lb. 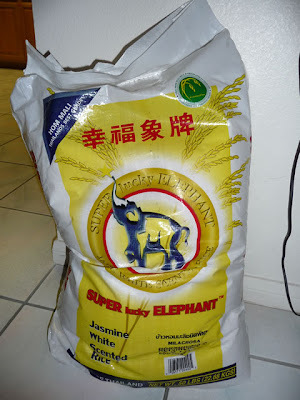 bag of jasmine rice was $26. That's still cheaper than other places but I think the last time I bought the same thing it was around $16, maybe less. And here's a bag of stocking (and stomach) stuffers. 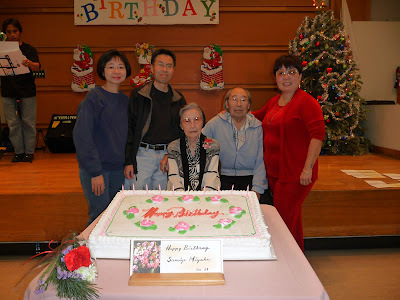 This afternoon at Keiro they celebrated the ten December birthdays of the residents in the intermediate care facility. My mom's was one of them. 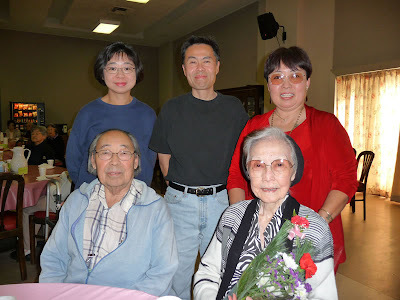 They held the festivities in the retirement center dining hall and it was pretty full. Here we all are in back of the birthday cake. 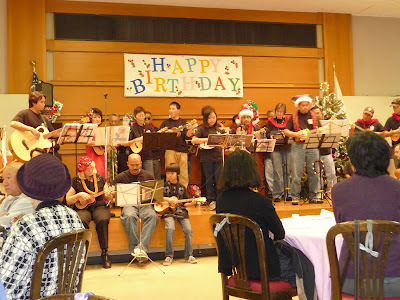 After the concert, which included a couple of hula numbers, cake was served. It was that light kind of yellow cake that Julie likes, which I call "air cake." I much prefer the dense, heavy stuff with lots of frosting like those sheets Costco sells but I guess that's not too healthy, haha. Here's another picture of us. It turned out to be a nice celebration. I have to hand it to the staff and the volunteers over there - they take such good care of the residents (and guests, too). I'm still sort of in a daze at all the changes that have taken place this year but I have so much to be thankful for. It's like Forrest Gump says in the movie (which he never said in the book), that life is like a box of chocolates - you never know what you're going to get. Really, that doesn't make too much sense if you think about it but it made people remember the movie. Christmas once again has sneaked up on us. It's hard to believe it is less than a week away - there's just not enough time to enjoy the season! Nevertheless, I hope that all of you are able to do so. Our landline phone is on the fritz. It was working earlier today (Friday) but this afternoon when I picked it up to call the office, there was no dial tone. Do you get the same eerie feeling I do when you pick up the phone and don't hear a dial tone? I feel like I am out of touch with the whole world - which is silly since I was sitting in front of my computer and the internet/e-mail was working fine. I also had my cell phone nearby. Funny, but just earlier in the day I was thinking about how sturdy and reliable the basic house phone is. Power outages don't affect it and I can't ever remember it breaking down. But then it did. Since I pay the bill online, I went to AT&T's website, logged in and clicked the link about troubleshooting. There was a box to check for "no dial tone," which I did and clicked the submit button. From there it had me enter various information and then do a test to see if the problem was within the house or outside of our circuits. I had to go to our phone junction box, which is in our garage (the only reason I know that is because the technician who handled the unsuccessful U-Verse install a couple of weeks ago showed me where it was; otherwise I woud never have found it), and plug a phone into the jacks inside the box. If I could hear a dial tone it meant the problem was inside the house. There was no dial tone, so the problem is somewhere before it gets to our house. I used the cell phone to call the number on the site to report the problem. I thought that might be better because it wouldn't be as impersonal as filling out a form online. Ha, I was wrong about that. Not once did I have the opportunity to speak with a living human being, not even one in India. The whole process is automated and is accomplished by punching in numbers to indicate choices. At one point in time I indicated I was not getting a dial tone. The next question I was asked by the automaton was, "are you calling from the phone that has the problem?" Huh?? Finally after going through all the steps, I made an appointment for someone to come out on Tuesday between 8 and 6 to repair the problem. Luckily I am not that dependent on the phone and I don't like talking on it anyway so it's no tragedy that it is out of commission. Now, had it been the internet connection.. Meanwhile, I had to use my seldom-used cell phone to call the office. I hate using cell phones! They are so small and inconvenient. Maybe I just need to get used to it. You know, all too often the level of customer service on the phone is so low it makes you want to scream. Still, there is something to be said for speaking with a real person and the flexibility that offers, as opposed to the static, inflexible way of dealing with a machine. I wanted to say, "hey, the problem is somewhere outside of our junction box so why can't you send out a repairman sooner? Why do I need to be home?" Of course, I'd probably get the same result from speaking to someone live, that sorry, they can't do that, but there's a certain amount of satisfaction to be derived from simply having the opportunity to ask about it instead of being herded through fixed choices with no other options available. What happened to the good old operator that was always there to help? Our kitchen is invaded with ants. Maybe it's the rain and cold weather that has driven them indoors, but for whatever reason they've been all over our kitchen counter. Since our counter has a granite finish it acts as a camouflaging background for them - you have to scan the surface for movement in order to detect them. Those little pests got into some crackers we had on the counter, even though they were apparently sealed in cellophane. And they tried attacking a bottle of olive oil - they were all around the cap but luckily couldn't get in. They also managed to somehow squeeze under the cap of a bottle of balsamic vinegar and got caught in the threads but luckily that bottle was nearly empty so I just threw it out. Spraying them is hazardous since that means putting poison near food areas. 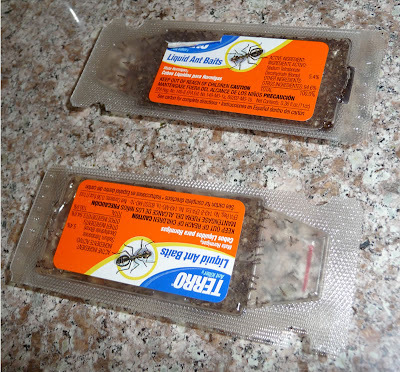 In the past I tried ant baits - the kind that are supposed to have poisoned food that the ants take back to their nest and poison their antmates but the problem is the ants show not the slightest bit of interest in it so it goes untouched. On Wednesday I used a different brand of ant bait than the ones I mentioned in the last paragraph - one made by Terro. It consists of poisonous liquid inside of a little plastic container. You snip off one edge to allow access to the liquid, then place it on a surface near the ants. The ants find the liquid, take it to their nests and poison their fellow pests. One box has six of these little baits. I used all six, putting them next to the microwave towards the rear of the counter. In much less than an hour's time, the counter was swarming with ants! They were congregated around all six of the bait stations like customers doing food sampling at Costco. I stood at the counter watching the ants. It was like they were on a giant playground. I also saw a few queen ants, easily identifiable because they were about 3-4 times larger than the workers. I am not sure if they were real queens or queens before mating (sorry to get so technical but I used to study ants and keep ant farms) that aren't able to lay eggs yet. Whether or not this was an egg-laying queen, I still considered her a menace to the kitchen. So I got my finger and squished her flat as a pancake on the counter. Instead of picking it up I left it there to see what would happen (I did this with three of them). The worker ants gathered around their flattened royalty. I couldn't tell what they were doing but there were these dark spots on the counter consisting of a mass of ants all surrounding and piling on top of the former queens. The latent scientist in me was wondering what they were trying to do. Was there some sort of chemical released when I smashed the queen that drew the ants to her? They sure weren't paying much attention to the queens pre-squish. Smashing regular worker ants did not elicit a similar reaction from the other ants. They walked up to the scene of the crime wiggling their antennae to briefly inspect the remains, then scurried away. Well, sorry if I grossed you out today! What do ants find humorous? The below video features their favorite actress playing the character that always makes the ants laugh. How can an ant be a bee at the same time?? That incongruity always makes them howl, pounding their six feet on the table, laughing their antennae off. This particular Christmas there was one thing I really, really wanted. It came in a big box and it was on the upper shelf at the Boys Market on Crenshaw Boulevard. It was a pretend car dashboard, complete with windshield, steering wheel, turn signal, ignition switch, transmission shifter on the steering wheel (that's where they used to be - remember?) and a fake AM radio. The turn signal lit up when you moved it to indicate a left or right turn or lane change and even made a clicking noise. How neat could that be? I was obsessed with getting it. Every time we'd go to the market I would gaze lovingly and longingly at that dashboard and remind my parents how badly I wanted it and how that would be the best Christmas present of all time. One evening shortly before Christmas we went shopping at Boys again. My parents put the big box in the cart. I couldn't believe it. They were actually buying my dream present and were buying it right in front of my eyes! They always went to great lengths to keep my presents a secret, but now they were doing this right in the open? Well, whatever. I was jazzed and didn't care if they kept it a secret or not. I was getting my fantastic psuedo-dashboard! I said nothing and they said nothing. I just kept staring at the box in the cart and felt all warm and fuzzy inside. Out in the parking lot they were putting the box in the trunk. "Wow, this is so good," I said. "I hope you don't think this is for you," my mom said. "This isn't for you, it's for your cousin Darryl." "We're buying this for Darryl. We're not getting this for you." "But I want this! I've been telling you all this time that I wanted this!!!" My parents were very calm. "We know that, but this is for Darryl." All of a sudden I hated my cousin. "That's not fair! Why are you getting this for him? He doesn't even want it! 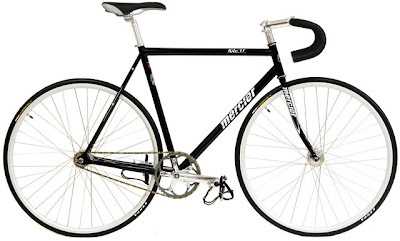 I want it!" Darryl was the luckiest kid in the universe. There was one mad little kid stomping around in the parking lot, throwing a tantrum by Crenshaw Boulevard and then in the car on the way home. I was completely mortified. How could they give the present that I wanted to my cousin? Why should they give him anything so nice? "Well can I play with it before you give it to him?" "No, don't you dare open that box." Sullen and dejected, finally I gave up. I couldn't believe my dream present was going to my cousin. The world was at an end. On Christmas morning I went into our living room and there in front of the tree was the big box. 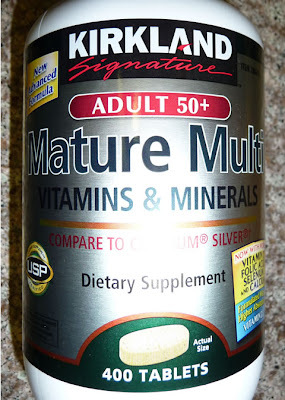 I started laughing when I realized how my parents had tricked me, and how stupid I had been to fall for their trickery. I also felt stupid for going into such a rage and thinking such unkind thoughts about Darryl. There it was, just like at the store. I couldn't wait to play with it. And you know what? This toy was boring. I mean, how much could you do with a fake dashboard whose only interesting part was a turn signal that clicked and lighted up? The radio didn't work. You could turn the steering wheel but so what? It didn't take you anywhere. I had imagined being behind the wheel of a real car, watching the scenery roll by, master of my destiny. But instead I was sitting there in a static living room. I hated to admit that what I had so badly wanted was not even something I desired to play with anymore, but what could I do? This was one boring toy. They should have given it to Darryl, haha..
Do Americans have a similar accent when they sing in Japanese? Anyway.. that guy playing the acoustic rhythm guitar looks like what might be the result if a computer morphed Rick Fukamaki from our high school days to the present time. When does your family open Christmas presents? On Christmas day or Christmas Eve? When I was still living at home, our tradition was to open them on Christmas morning. But, we could open one on Christmas Eve. As soon as presents started appearing under the aluminum Christmas tree, I would eye them to determine just the right candidate for opening on the 24th. I'd pick them up and try to see through the wrapping paper - curses, foiled again! Yes, the foil was impossible to see through. And the ribbons were put on so tight I couldn't possibly open the ends of the wrapping to peak at the side of the box. I'd shake them, hold them under a strong light to enable x-ray vision, and subject them to whatever other method of analysis I could in order to get a clue as to what treasure was inside the package. Almost all the time my efforts were fruitless. On this particular Christmas Eve I decided to go for size. I chose the largest box and declared that this was the one I wanted to open. My parents tried to talk me out of it. My mom handed me a much smaller package and suggested it would be more suitable. Ah, I must really be on to something, I thought. They want me to save the big box for Christmas so there must be something really, really swell inside. "No, I want to open the big box." "I don't think you're going to like that as much as this one," my mom replied, offering the smaller box to me. "You really should open this one." The more she insisted the more confident I was that I had chosen the mother lode. It's like when you've discovered where the hidden treasure is buried and the keeper of the treasure is trying to misdirect you to keep it safe. But I wasn't falling for that. We went back and forth until finally my mom gave up. "Okay, it's your choice, do what you want." Without a second thought, I gleefully began to open the package. As the box cover was revealed, the gloating smile turned to a frown. No, it wasn't clothes, something I dreaded getting as a Christmas present. It was a racing car. 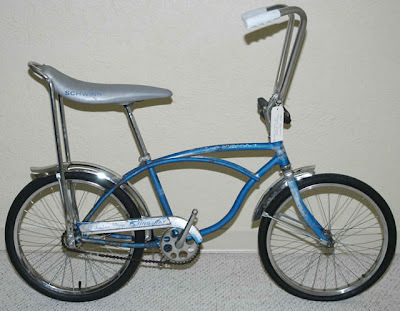 One that you had to use outdoors. It was Christmas Eve. It was too dark and too cold outside to use it. "I told you," said my mom. My dad and sister just smiled at me and told me I should have listened. This couldn't be. How could I have picked something like this? Why didn't I listen? I thought my mom was trying to trick me! Argh!!! "I wanna take it back!" I pleaded. "No, just one present. You already opened it." "It's not fair! I can't use this!" "You're the one who chose it. I tried to warn you but you didn't listen." "Well I wanna change my mind now! Please? Please??" I sounded like one of the big three auto makers. All I could think about was why didn't I listen to what mom said? I blew it. The next day on Christmas morn, I discovered what was in that little box. A book about insects that I had wanted. Wouldn't it be grand if we could all get two weeks for Christmas vacation, same as we did back in our school days? I guess those who work for school districts still do (although they don't call it "Christmas" vacation anymore, bah humbug). Every year, when I was little, I'd look forward to our annual trip to go Christmas shopping in Downtown Los Angeles. I loved riding the streetcars. I think the one we took was referred to as the "J" car, although the "P" car rings a bell, as well. 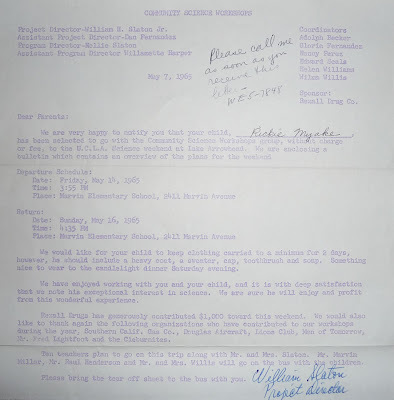 The letters referred to the different routes they took. My vague memory tells me "J" stood for Jefferson and "P" for Pico but I could be wrong. For those of you who don't know, the streetcars ran on rails, like trains. Above the cars was a large rod that connected them to overhead wires from which, I assume, they got their electric power. I was fascinated by the complex grid of wires stretched along the route and how intricate they were. The ritual involved my mom, sister and I getting on the streetcar and riding it to Broadway in Downtown where the major branches of all the department stores were located: May Company, Robinsons, The Broadway and Bullocks. Were they really as huge as I remember them? In my mind they dwarfed today's department stores at the malls but I was just a little thing back then so maybe that's why they seemed gigantic. I liked the book departments. I was always looking for books about insects (weird me). I hated when my mom and sister looked at clothes patterns because they seemed to take forever, perusing the Butterick and McCalls and other pattern company catalogs, then looking for the right material. Bratty me would insist that they just buy anything and be done with it. "Just get that one! That one looks good! Can we go now??" Normally we'd take the escalators. I found that fun, too. At the beginning of every escalator was a panel with a warning to hold the handrail. The panel was off on one of them (or maybe I took it off) and underneath were a couple of buttons. I pushed one. The escalator stopped. All of the people above us looked down at my mom and me, wondering what happened. My mom panicked. "What did you do???" Everyone continued to stare. "What's the matter with you, Rickie? What did you do?" Cool as a cucumber, I pressed the other button and the escalator promptly started moving again. My mom was soooo mad. "If you press one and it stops, the other one must make it start," I calmly explained. "I've never been so embarrassed!" she hissed through clenched teeth. "Don't you ever do that again!" As we rode up the escalator I was wondering what was the big deal. Did you ever notice in those department stores that there were round gold circular plates embedded in the floor? I used to wonder what those were for. I still wonder. And did you ever notice how periodically a soft-toned bell would ring, sometimes once, sometimes two or more times? I would wonder what that was for, as well. I thought if I stepped on the gold disc that would make the bell ring. It didn't. Except once. Every time I stepped on the disc, the bell would ring. I thought I was on to something. I did it a few times with success but then it didn't work anymore. I've always thought that an employee must have seen me doing that and rang the bell just to humor me. And probably got in trouble when their supervisor saw them. "What the heck are you doing???" Then the employee would sheepishly point at me and offer a feeble explanation. Eating at Clifton's Cafeteria was also part of the ritual. I loved the way it was decorated with its indoor waterfall and forest-type atmosphere. Every year I would order the same thing: the roast chicken plate and jello for dessert. I don't know why I ordered the jello since I never finished it. I think it was because it looked like cubes of rubies and emeralds in the glass. It looked better than it tasted. No streetcar on the way home. We took a Yellow Cab. I don't think there were any other cab companies back then. With all the bags from shopping, it was easier to hail a cab and have them deliver you to your door instead of walking from the streetcar stop. I was so sad when they retired the streetcars. Riding the bus was a disappointment. Not long after that our Christmas Downtown sojourns ended; the end of an era. It was such a fun day for me and, like Christmas, it came but once a year. This Saturday began just like any other for me, with a trip to Costco. I noticed it was more crowded than its been for the past few months, most likely due to Christmas shoppers. Since the boss (Julie) has somewhat lightened up on her anti-new flat panel TV stance, I took a look at what was on display at Costco and spied a Toshiba 37" for $599.99 after a $50 instant rebate that expires on 12/21. That's the same instant rebate and price they had last week, expiring 12/6. After fawning over the sets for a while I came back to reality and did my shopping off the list. There were only a couple of "new" items I bought today. 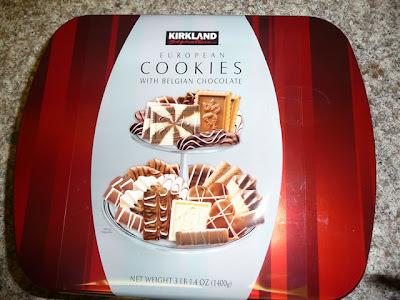 One is an old Christmas standby, the heavy box of Belgian cookies that are oh so yummy. I got a few boxes to give as gifts, since everyone likes to eat. The other item was a package of AA batteries. 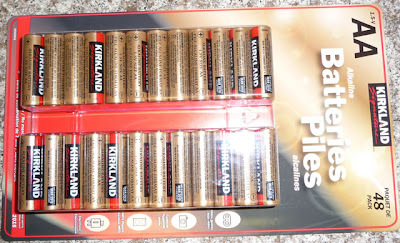 The Kirkland brand is cheap compared to other alkalines and they seem to last just as long, if not longer than the more expensive Duracells and Energizers. I came to the checkout area from the east side of the store and saw a very long line of people. However, this line was all for the east-most register and the lines for the other registers were a lot shorter. I just pushed the cart to a different register where there were only two customers in line, as opposed to the 8 or 9 in the far east register line. I stood there looking at the people in the longer line, wondering why they were all waiting there while the other lines were shorter. They stood there glancing at the other registers but not budging. Was there something special about that line that I missed? I can only conclude that they all must have arrived in that line from the same direction I did, and figured all the lines were equally long. Or, when they saw the shorter lines at the other registers, they thought by the time they changed lines, other customers would have beaten them to it. Or, they were just plain stupid or had nothing better to do on Saturday morning than wait in line. When I left, that line was still long and the other ones shorter. Go figure. In the afternoon I decided to go on a fact-finding tour. Since Best Buy and Circuit City are both very close to the house, I didn't need to feel guilty about using up too much gasoline to drive there. Besides, it was a mere $1.639 per gallon this morning at Costco. First I went to Circuit City since I don't particularly like Best Buy, plus I feel sorry for them since they are going out of business. I looked at the 32" and 37" LCD panel televisions and honestly wasn't overly impressed by any of them. The images of people looked like claymation or a Pixar production, or like they were a video game. The Samsung models seemed to have the best picture. This morning when I saw the Toshiba on sale I was already plotting how to get that into the house but when I saw it on display at CC, the picture quality was disappointing relative to the others. To CC's credit, I was approached by 5 or 6 friendly employees who asked if I needed any assistance. Thinking maybe the sets were not adjusted very well, I decided to look at what Best Buy had. Only one person asked if I needed help at Best Buy and she was more like a "you don't need any help, do you?" type of person. The TV's weren't set up very well either so it was hard to compare. But like at CC, the Toshiba didn't fare as well compared to the other brands. Sony and Samsung looked the best. But again, like CC, people still had a claymation appearance to them. I had my eye-fill so I left. I feel like Best Buy is an evil place. The day was crisp and clean - downright windy at times with rain threatening to fall at any moment - and was beautiful. Sigh, I suppose unless I were to purchase an expensive Blu-Ray player or get some other HDTV device that played at 1080 resolution, I suspect the picture on our good old Panasonic CRT is going to look better than any LCD, at least the ones in my price/size range. I sat next to Roy Marubayashi in the violin section of Foshay's orchestra. We sat behind Lena Wong and Charmi Tsutsui. I always thought Roy and I played better than the two girls but the teacher liked them more because.. well, because they were girls, haha. Roy subscribed to a philosophy that prevented him from becoming too exuberant about any good fortune that happened to grace his life. "Anytime something good happens," he declared, "something bad happens right after it." In a perverse way I suppose that means you should look forward to bad things happening because the good will surely follow. Maybe it's nothing more than just the law of averages, with some people being more or less lucky than the average joe. I find I've subscribed to Roy's theory over the years and become wary if too many good things seem to happen, even though there is no causal link between good and bad. There's a lot of people who also subscribe to Murphy's Law: What can go wrong will go wrong. They can point to our government as a case in point. Well, I thought I'd interrupt my walk down the lane of Christmases past and let you in on a fantastic way to get rich in the stock market. Sort of my Christmas present to you. I'll give you my own rock solid theory. Are you like me? When you invest in something, like say you buy shares of stock, does the value immediately take a dive? I'll be watching a particular stock, waiting and waiting for it to come down to a certain price that I deem is at the point where it is worth buying. It seems to dance around just above that price forever but then briefly, it dips and I snag some shares. Then minutes, if not seconds later, the price starts heading south like it was being chased by a bear. I stare at the screen in disbelief. How can it be that as soon as I make my purchase, all of sudden the price drops like a lead balloon? This has happened so many times to me that I am becoming paranoid, like someone is deliberately watching what I do and my purchase acts as the trigger for a massive selloff by everyone else on Wall Street to drive down the price. Same for when I decide to sell. I'll set a good price to sell and the stock seems to dance around forever just below that price. But then it inches up and the transaction is done - I sell. Just the opposite of when I make a purchase, only minutes and if not seconds after I sell, the price goes shooting up like a meteor in reverse. I start laughing like a madman. Are you like me? Do these things happen to you? Well here is my secret advice worth millions of dollars - just do the opposite of what you think should be done. It's as simple as that. Go right when you think left. Go left when you think right. If your instincts tell you to buy, put duct tape over it and sit tight. Same about selling. If your instincts tell you it is stupid to buy now, get in touch with your broker and load up. If they tell you now is not the time to sell, get out while you can. That's it. Could it be any easier? There are tons of books written by very wise people about the stock market that tell you that you can't beat the market. They point to all the mutual funds out there run by supposed stock market gurus whose returns fall short of what could be done by merely throwing darts at a list of stocks, or by buying an index fund. Well obviously it means people are making the wrong choices. If your instincts tell you to make the wrong choices most or all the time, then doesn't it follow that if you disregard your instincts and do the opposite, you will actually make the right choices most or all of the time? That's my elegantly simple theory that has evolved over the many years since junior high school when I was exposed to Roy's Theorem. Think it's gonna be heads? Call tails. Think Rock is gonna win? Cut that thought and go with Paper. I'm whacking myself on the head Korean-style for not thinking of this before! Pabo! Christmas 1966, Mrs. Capps' class at 6th Avenue Elementary. Us boys' contribution for the Christmas program was to recite a poem, Eugene Field's Jest 'Fore Christmas. We had to memorize the poem. I don't remember memorizing that much, though - maybe we recited the abridged version. 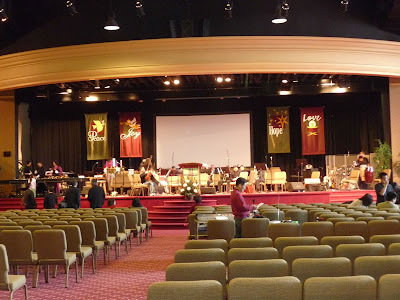 I can still recall standing on the auditorium stage doing our final rehearsals. We lined up in a single semi-circle, standing there watching each others mouths to cue us on saying the right lines in unison while the girls watched us from the seats in the audience. I recall practicing the lines at home, too. We all took the task seriously. When it came time for the actual program, we aced it! Quite an accomplishment for a bunch of sixth graders who didn't like to stay still, I'd say. The only other school Christmas programs I remember aren't mine, but the ones Greg and Katie were in. By that time the programs had become increasingly generic and the word "Christmas" was hardly mentioned, if at all. It had become a "holiday program." That's sort of like taking A Charlie Brown Christmas and changing the music..
My early Christmas memories include an aluminum tree with red bulbs. Yes, aluminum. It was only about three feet tall and had branches with silver aluminum foil needles. Didn't even need to hang tinsel on it; just the red bulbs, crown it with the top ornament and it was done. We'd also put a red lightbulb in a small lamp and shine it on the tree for effect. Hardly a realistic Christmas tree, but its the memories it holds that make it endearing for me, regardless of composition. I so wanted lights on the tree, however. My mom told me you can't put lights on an aluminum tree because they wouldn't work, but I didn't believe her so I kept nagging her about it. It made no sense to me - if the cord was insulated, then what difference should it make what material the tree was made from? Finally she gave in and we strung lights on the tree. We plugged them in and.. nothing. My mom had been right. I was in disbelief. I was sure the lights would come on and we'd have one beautiful sparkling aluminum tree but it didn't happen. During high school began a string of fresh, real trees. Well, as fresh a tree as you can get when you roll the dice with being in Southern California and its heat waves. Nothing compares with the smell of fresh Christmas trees, does it? But after many years, not long after we moved into our present abode, we decided to go the artificial route. The increasing price of trees, the hassle of trying to transport it home, maintenance and the trail of needles it left all over the place tipped the scale the other way. We found a decent one at WalMart and brought it home. Of course your nose will immediately tell you the tree is fake, but sight-wise, unless you are close up it is hard to tell if the tree is real or not. Disposing of a real tree can be problematic as well. I guess that's why some people put it off as long as possible. I can remember driving down a Monterey Park street and seeing a discarded tree waiting for the next day's rubbish pickup. In July. Anyway, it's not the tree per se, but what it stands for and the memories associated with it. The Christmas season has always been my favorite time of the year and I always love listening to Christmas carols. A lament I've had through the years has been that it doesn't seem like Christmas - not like when we were little when Christmas vacation seemed so long and the anticipation built up day by day. These days as I try and get into the season, it goes all too quickly and is gone. So here's hoping that this feels like a true Christmas season for everyone. I'll be posting some memories of Christmas past in the upcoming days and hoping we don't have a heat wave! Whoever is reading this, may you have a truly blessed and merry Christmas! I must sheepishly admit I've never been to Tak's. It's a place I've been wanting to go but like so many other things with me, I haven't gotten around to it. Seeing the video refreshed my desire to take a trip back to the old 'hood to check it out. I can still picture the interior of the Holiday Bowl coffee shop, of sitting at one of the tables next to the window and looking out onto the night scene flowing past on Crenshaw Boulevard. The song I associate with those times? Van Morrison's incredible Moondance. The coffee shop was almost always a late-night thing, just like the song. They mentioned the Watts riot in the first video about Tak's. What I remember most about those days in August, 1965 was being in the car with my parents and sister, joining a long line of other cars that drove through the area after all was said and done while the National Guard directed us as though we were entering the Disneyland parking lot, and then it was off to the rides.. not quite "It's a Small World." We trimmed our artificial Christmas tree over the weekend. I got out the boxes of lights, took out and unraveled the cords, screwed in the lightbulbs and then plugged it in. Like every year, some of the lights didn't work so I twisted them a little bit to create a better connection. Unlike past years, however, this time something blew out and all the lights went dark. It was no use checking the fuse since we don't have a spare fuse and the lights are so old I don't know where we'd find a new fuse anyway. I guess it was time to get a new set of lights. I had those lights a fairly long time - since before Julie and I got married. I was sad that they didn't work anymore. Even though they're nothing more than inanimate objects, I still felt sorry for them since they'd sort of been a part of the family for so long. Sort of like old friends. Does that sound crazy? Julie doesn't share my sentimental bent, though. "Throw out those lights - don't keep them since they're no good." I've always felt that way about things I've had for a long time. When I was little I would get very sad when my mom replaced my pillow; I wanted to keep the old one even though it had gotten worn out. After all, the pillow had been my companion every night while I lay there sucking my thumb. It was akin to Linus' security blanket! I know these things can't possibly have any feelings. Still, I feel sorry for them. Well, the Christmas tree lights didn't totally disappear. The cord did, but I kept the bulbs. They happen to be the same size as our nightlight so now we have plenty of replacements and can also have a variety of colors - red, green, blue and amber. Instead of going back to reside in the box with all the other Christmas tree trimmings, they are now in the cabinet. They've just moved, is all. Here I am again, the broken record, with more railing against the real Axis of Evil. Not the three countries George W named a while ago, but the true Axis that has infiltrated our country and has existed amongst us for years and years, slowly festering and dragging us all down. Now, what do you notice in those lists? 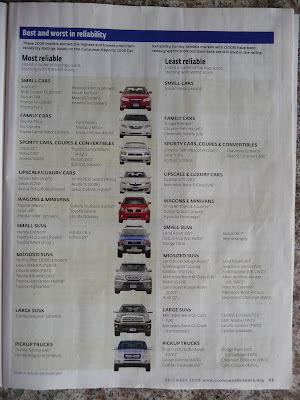 Hmm.. how many cars from the Axis of Evil Automakers do you see on the left side versus the right side? How many non-Axis member models do you see on the right side? Does that tell you anything about the quality of the cars? So again I must ask, why are we bailing out three companies that have made and will continue to make junk?? What have these automakers been doing all these years? And now after they've squandered all their money and supply has far exceeded demand for their products (for good reasons), they now say they are going to be better citizens? Sorry, but giving them any sort of handout is like putting pearls before swine. And, did you know that the parasitic leech unions also have a fund set up that gets its money from the automakers, whose purpose is to provide laid-off workers with almost full pay? Now excuse me if I am wrong, but layoffs happen for economic reasons; i.e., if a company cannot afford to pay salaries to everyone, they are forced to lay off some of its employees in order to save money. So if that same company then has to contribute money to a fund in order to keep paying these laid off workers, what exactly has been saved? What's the point of laying them off in the first place? I know companies are required to contribute to a state unemployment fund, but we're talking contributions far in excess of that. Congress: We're giving you a bailout. Evil Axis Automakers: Uh, uh, there's only $25 billion in here. Congress: That's right, that's what you said you needed. $25 billion. Evil Axis Automakers: Uh, well, that was yesterday. And yesterday's gone. Today's estimate is $50 billion. Congress: $50 billion? It went from $25 billion to $50 billion that soon?? Evil Axis Automakers: It'll be double tomorrow if you don't give us what we want. Give it to us. The union needs half of it too. And before Christmas. Or else this country's going down. Congress: You want $50 billion? Evil Axis Automakers: At least. And make it quick. Congress: You want $50 billion and you want it quick? Evil Axis Automakers: What don't you understand? Read our lips, buddy! Our rented hybrids are waiting to take us back to our private jets. Congress: No bailout for you!!! Sigh, if only life were that sensible.. I made my usual Saturday morning visit to Costco. What a beautiful day it was - absolutely clear, with a nice, crisp feeling in the air. With a day that nice, I guess it would be asking too much to have UCLA whip USC as well. I was right. Oh, well. Gas is down to $1.719 at the Azusa Costco location. Another amazing tank fillup under $20! I thought of a great idea for a Christmas present for my folks that fits with their more limited, small-space lifestyle. Digital picture frames. They're pretty expensive! There also seems to be a significant price difference between 7" and 8" frames and I think it is because 7" frames are in widescreen shape and 8" are in normal shape, the kind most pictures come in. If you view a regular picture on a widescreen frame, either it will be stretched so that the image is squatty, or else there will be black bars on each side to retain the original aspect ratio. After seeing what they had at Costco I came home and checked out Best Buy and Circuit City's websites, as well as Amazon. Seems like you really can't get a decent 8" non-widescreen frame at a decent price. I think I'll get it at Costco because from reading consumer reviews it sounds like they have a lot of problems so at least Costco has an excellent return policy in case something goes wrong. I didn't get much in the way of new (i.e., first-time purchase) stuff. I am still mourning how the San Diego Costcos outshine the ones up here. 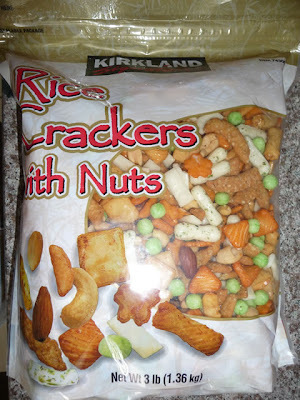 Julie likes the Costco rice crackers so I bought a bag.. I don't know why she likes this counterfeit stuff. Maybe because she's Chinese? 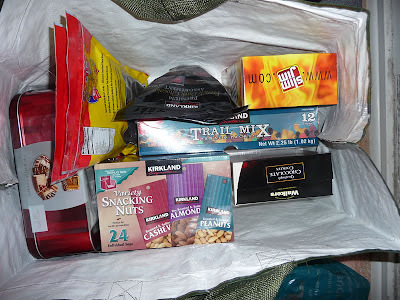 Haha..
And a double-bag set of beef jerky. Costco still has great prices on jerky. 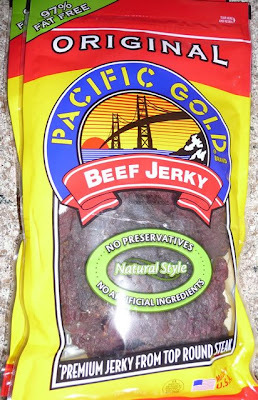 Greg used to want me to get him the beef sticks that they sold in the bin next to the jerky when he was in grade school. I found out that he was selling them to the other kids for a quarter a pop! He told me other kids saw what he was doing and started selling food items as well which led to everyone getting into a discount war so he gave up. Welcome to real life, eh? 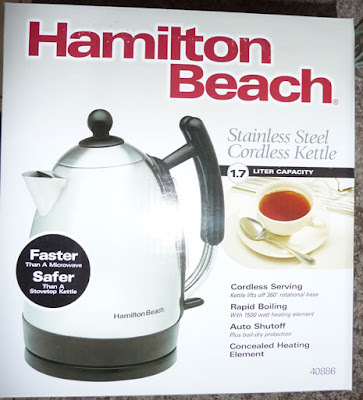 When we were at her brother's house in San Diego on Thanksgiving, Julie was admiring the electric kettle they had. 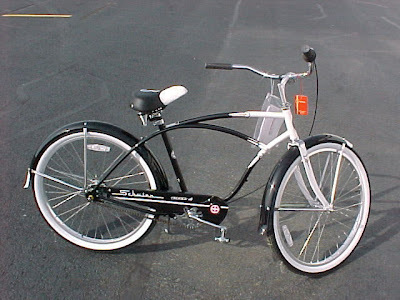 I bought one today for one of her Christmas presents. When I got home I checked the mailbox and it was empty. Well, not exactly empty. 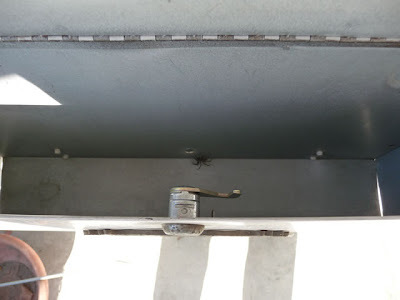 The mailman hadn't come yet but there was a spider inhabiting our box (it's kind of dark but the spider is in the middle near the lock). I tried to shoo it away but it ignored me so I left it there. Later on I heard the mailman drop off the mail so I went outside (the box is next to the doorway) and carefully picked up the mail so as not to pick up the spider as well. Then I looked inside the box and the spider looked like it had gotten smashed. Given the amount of mail that came, including a couple of magazines, that was a distinct possibility but nope, it got up and started walking around. So I left it to face another day of avoiding an avalanche of paper. 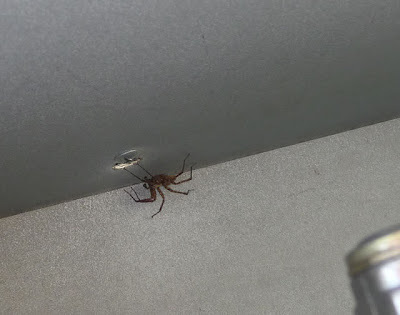 Now of all little creatures, you would think that a spider would realize the three most important aspects of being a successful spider are location, location and location. That's got to be important for a spider, wouldn't you think? What are you going to catch inside of a mailbox?? Then it threw up a web that stuck to the lid of the mailbox, pulled it down and slammed it shut, lol..
One of the loneliest times in my life was the first time I spent a night, two nights, actually, away from home. These classes are designed to develop interest and background for fifth and sixth grade pupils in various fields of science; to stimulate creativity and curiosity while children are still eager to learn [my interpretation: before they become teenagers, and certainly before they become adults in the working world]; to help pupils develop research techniques, record ideas and share them. 11 elementary schools participated, each school focusing on a different field of science apparently based on the instructor's expertise. Our classes dealt with biology and met every Thursday afternoon from 4:00 to 5:00. Notice that Rexall Drugs contributed $1,000 to help pay the expenses. Whatever happened to them? Did they become Thrifty? And why do people like to burn down Thrifty Drug Stores when they riot? Is that the storefront of preference? 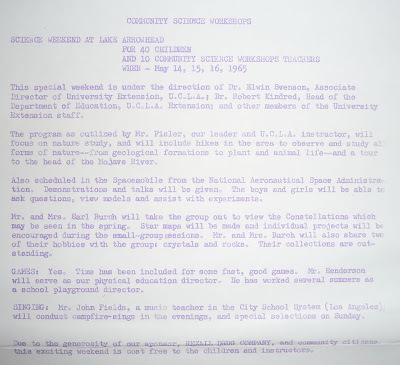 Here's a copy of the letter that described what would take place that weekend (again, click the image for a larger version). I found it odd that there were 40 kids from 11 schools, yet only one from my school. That's a rather disproportionate selection! You would think I'd be jazzed at the opportunity to attend a weekend outing like that, wouldn't you? Well you'd think wrong. I wasn't looking forward to it at all. All I could think of was how I'd be away from home all by myself with no one I knew, not even our teacher going to be there. Friday afternoon rolled around and my parents drove me to Marvin Avenue Elementary in my dad's '62 Ford Fairlane. I was downright glum. When the time came, I trudged onto the bus and found a seat. I couldn't be unhappier. With tears in my eyes, I could only give a brief glance at my parents as they waved goodbye to me, and manage a weak wave in return. What do I remember from that trip? That all the other schools had more than one representative so everyone but me had classmates to keep them company. There was a JA boy and a couple of black girls who befriended me but I was still miserable. I also remember pine trees, vaguely recall a dining room and wondering what we were going to eat, and that's about it. I don't even remember if we had single or shared rooms. The eternity of two days away from home finally ended when the bus arrived back at Marvin Avenue and there were my parents waiting to greet me. Oh, was I happy!